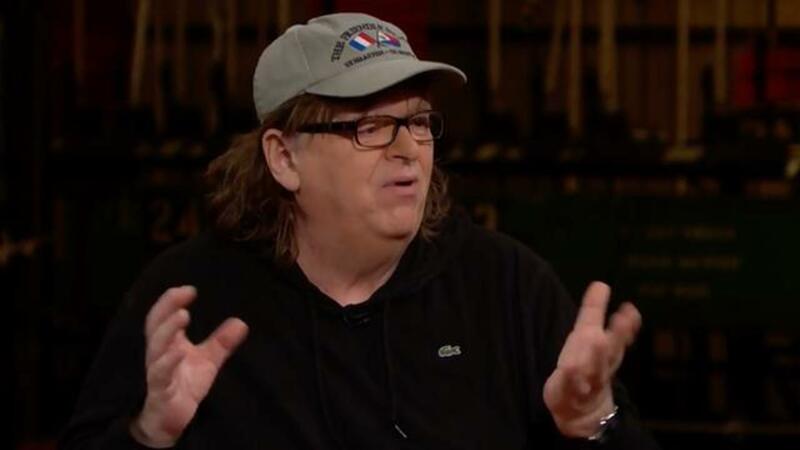 Michael Moore is at it again. Always up for stirring the pot, the Oscar-winning director has been busy this political season with his comments on how women in US politics have "fake power," standing outside of Trump Tower with a sign that read "We are all Muslim," and now, he's written an open letter to the presidential Republican nominee's daughter, Ivanka. For the site Alternet, Moore tells Ivanka, "I'm writing to you because your dad is not well," and says he needs an "intervention." "I believe only you can conduct it," Moore wrote. Jared Kushner and Ivanka Trump attend the Costume Institute Gala Benefit to celebrate the opening of the 'American Woman: Fashioning a National Identity' exhibition at The Metropolitan Museum of Art on May 3, 2010 in New York City. Kai Madison Trump,Ivanka Trump and Donald Trump Jr. attend the 4th annual Eric Trump Foundation Golf Invitational at the Trump National Golf Club Westchester on September 14, 2010 in Briarcliff Manor, New York. He goes on to say that Ivanka's father "has encouraged and given permission to the unhinged and the deranged to essentially assassinate Hillary Clinton," following the 2nd Amendment comment Trump made earlier this week. "I say this with the utmost kindness, care, and concern for you, and I know you will do the right thing," Moore said. "Bring him in, off the road, away from the crowds. Now. Tonight." "Dad, we need to have a chat. Are you feeling okay? Do you have a minute? Please sit down. Because this isn't going to be easy. No, I am not pregnant. No, what is going on is... is... I am really, really worried about my father. About you. "Dad, I owe everything to you. You've built an empire, a brand and a business for the ages. You have taken care of me, inspired me and, through your example, have made me who I am: a self-confident, honest-to-a-flaw, woman. "But Dad, I am deeply worried. You haven't been yourself lately. The father I know is not a hater, not someone who encourages violence. Dad, you used to be A LIBERAL. You raised me as a liberal! The Clintons were your friends—Chelsea is one of my best friends! And now you're joking that Hillary should be assassinated? Really? "Dad, I hate to say this, but you're making me scared, you're making my friends scared, and you're scaring the whole country. "Dad... Dad, sit down! They'll wait. I am not finished. Don't get angry. Try to listen. "Yes, I know they love it, the crowd goes wild. But not for YOU. They don't love YOU. They love the show that you put on. But people who hunger for red meat will turn on you in a minute. No, they don't love you. I love you. I will always love you. And I see you hurting yourself—and you're hurting ME, Dad. "Don't get upset! You're still the handsomest billionaire I know. I will always love you. Melania will always love you. Vladimir will always love you... OK, maybe that wasn't funny. But you get my point. This running for president thing is destroying the dad I have known and loved. And honestly, you and I both know you didn't really want this job to begin with! You just wanted to make a point. OK, well, POINT MADE! You did it! Now, let's stop and get some help. "I am asking you, right now, to give it up. To leave the race. Let that nice man from Indiana run things. Your place in history is secure. You need to withdraw. Move on, for your sake, for the country's sake, for my sake. "The man who raised me was the man who, for no charge, built a huge ice rink in Central Park for all the people to use! You struck deals with some of the biggest assholes on the planet in finance and politics and yet remained friends, mostly. You built a family that loves you. I want that dad back! And I worry that, if you don't stop now, neither you nor the country will ever recover. "There, there, Dad, it's okay, let it out. Let it out, because I know beneath that gruff, tough, handsome exterior is a little boy who just never got enough love. And that little boy needs some time to find himself again. "Let's you and I walk out there right now. The cameras are all set up and waiting. You can make up whatever excuse you want. You can blame whomever you want. You're good at that! I just know this can't go on, and you know it, too. "Take my hand, let's end this. And by tomorrow you and I will be sipping martinis on our yacht in the Hamptons with Chelsea and the friends we still have left. I love you, Dad. Let's do this. That's right, take my hand, here we go..."
You may remember (you do, after all, have a "perfect memory! "), that we met back in November of 1998 in the green room of a talk show where we were both scheduled to appear one afternoon. But just before going on, I was pulled aside by a producer from the show who said that you were "nervous" about being on the set with me. She said you didn't want to be "ripped apart" and you wanted to be reassured I wouldn't "go after you." "Does he think I'm going to tackle him and put him in a choke hold?" I asked, bewildered. "No," the producer replied, "he just seems all jittery about you." "Huh. I've never met the guy. There's no reason for him to be scared," I said. "I really don't know much about him other than he seems to like his name on stuff. I'll talk to him if you want me to." And so, as you may remember, I did. I went up and introduced myself to you. "The producer says you're worried I might say or do something to you during the show. Hey, no offense, but I barely know who you are. I'm from Michigan. Please don't worry -- we're gonna get along just fine!" You seemed relieved, then leaned in and said to me, "I just didn't want any trouble out there and I just wanted to make sure that, you know, you and I got along. That you weren't going to pick on me for something ridiculous." "Pick on" you? I thought, where are we, in 3rd grade? I was struck by how you, a self-described tough guy from Queens, seemed like such a fraidey-cat. You and I went on to do the show. Nothing untoward happened between us. I didn't pull on your hair, didn't put gum on your seat. "What a wuss," was all I remember thinking as I left the set. And now, here we are in 2015 and, like many other angry white guys, you are frightened by a bogeyman who is out to get you. That bogeyman, in your mind, are all Muslims. Not just the ones who have killed, but ALL MUSLIMS. Fortunately, Donald, you and your supporters no longer look like what America actually is today. We are not a country of angry white guys. Here's a statistic that is going to make your hair spin: Eighty-one percent of the electorate who will pick the president next year are either female, people of color, or young people between the ages of 18 and 35. In other words, not you. And not the people who want you leading their country. So, in desperation and insanity, you call for a ban on all Muslims entering this country. I was raised to believe that we are all each other's brother and sister, regardless of race, creed or color. That means if you want to ban Muslims, you are first going to have to ban me. And everyone else. Just as we are all Mexican, we are all Catholic and Jewish and white and black and every shade in between. We are all children of God (or nature or whatever you believe in), part of the human family, and nothing you say or do can change that fact one iota. If you don't like living by these American rules, then you need to go to the time-out room in any one of your Towers, sit there, and think about what you've said. And then leave the rest of us alone so we can elect a real president who is both compassionate and strong -- at least strong enough not to be all whiny and scared of some guy in a ballcap from Michigan sitting next to him on a talk show couch. You're not so tough, Donny, and I'm glad I got to see the real you up close and personal all those years ago. We are all Muslim. Deal with it. P.S. I'm asking everyone who reads this letter to go here (http://michaelmoore.com/weareallmuslim), and sign the following statement: "WE ARE ALL MUSLIM" -- and then post a photo of yourself holding a homemade sign saying "WE ARE ALL MUSLIM" on Twitter, Facebook, or Instagram using the hashtag ‪#‎WeAreAllMuslim‬. I will post all the photos on my site and send them to you, Mr. Trump. Feel free to join us. Film maker Michael Moore poses with the Palme d'Or at the Palais de Festival during the 57th Cannes Film Festival in France. The top prize was awarded to Michael Moore's Fahrenheit 9/11, a scathing indictment of White House actions after the September 11 terror attacks. It is the first documentary to win Cannes' prestigious prize since Jacques Cousteau's The Silent World in 1956. Michael Moore arrives for the premiere of the new film 'Aviator' at the Mann's Chinese Theatre in Hollywood. Directed by Martin Scorcese, the film tells the story of avition pioneer Howard Hughes. AP OUT Michael Moore attends a photo call for his new film Sicko, at the Palais de Festival during the 60th annual Cannes Film Festival in Cannes, France. Writer/director Michael Moore attends the 'Captain Mike Across America' press conference during the Toronto International Film Festival 2007 held at the Sutton Place Hotel. SEE ALSO: Michael Moore: "I think Trump is going to win"